Stuff Points: Earn 62 points when you buy this stuff. 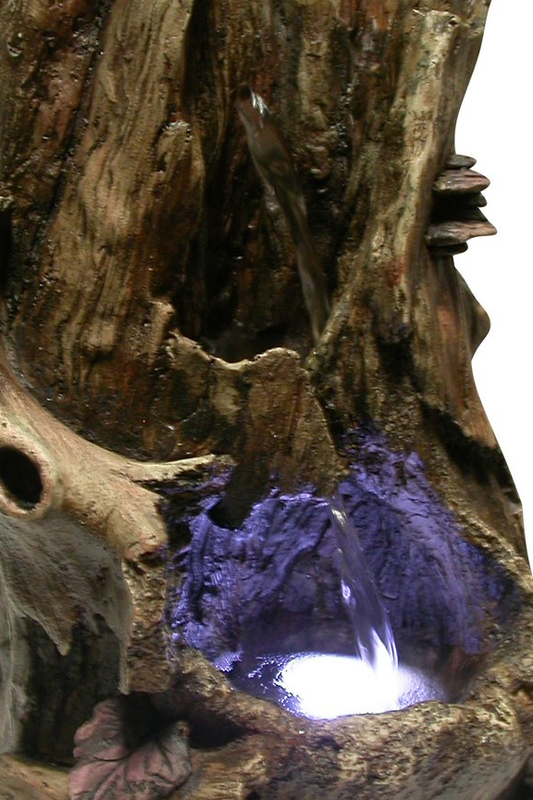 Large openings in the remnants of a decaying log create the perfect pools for this table top water feature. Intricate details make it look like the real thing, but it's actually made from a fiberglass resin, not real wood. Natural styling causes it to appear as though it was freshly pulled from deep within a forest, but the clean and durable materials allow you to use it anywhere. It plugs into a regular outlet, and it continuously cycles the same water, so set up is easy. The strong and long lasting resin is safe for outdoor use, but this model is also compact enough for easy placement inside too. The powerful pump will pull water up to fill the pool at the top. Once it fills, and endless stream will begin to cascade and spill over the edge. The waterfall drops down to fill the lower pool, and once it reaches capacity, the pump will cycle it back up to the top. Underwater LED lights shine brightly from beneath the water, and it really enhances the effect. This relaxing fountain will bring a calm touch of nature to any room in your home, and the soothing sounds will relax your mind an body. With top quality craftsmanship and a one year warranty, this model makes a great choice for any home or office location. Complete. No extra parts to source, and nothing to buy later. This model will be nearly assembled, and it will come with everything you need to make it work. LED Lighting. 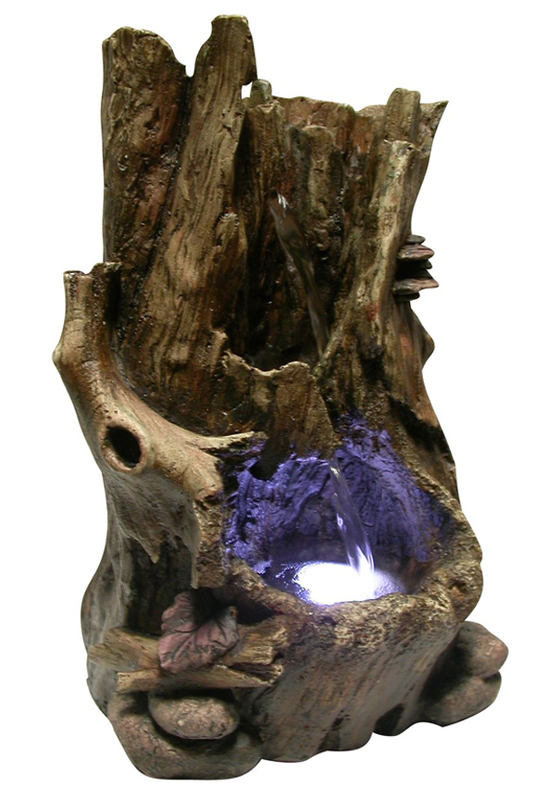 Bright lights enhance the moving water, and reveal details in the wood by shining up from under the water. Inspired by Nature. It looks like a real tree was used to build this fountain, but it's actually a lightweight and durable material that provides the same look without any of the down sides. High Quality. Close attention to detail makes it look better than other options and long lasting electronics will allow it to operate without failing for a longer period. Place Anywhere. Durable materials make it safe for outdoor use, but the compact, self-contained design also makes it work well indoors. Easily place this model any where you want. A decaying log creates the perfect vessel for flowing water. Bring the outdoors into your home, or enhance a backyard patio. Order Yours Today!